Welcome to Dead Tree Studios. Want to see some of the art we are creating for this project? Click here to our gallery. Pretty quick and easy Dev blog this week! Lots of art for the locked safe got completed, and we are still looking at having all of it done for the end of April. With all the more complex and detailed art *Cough* weapons and Armor *Cough* done, most of the miscellaneous items have been getting completed at a rather fast pace. So things are looking like they will be done on time! DTS will be running games of Fallout Equestria Everyday, and having a special demo Saturday, Sunday and Monday! Our Panel is also Saturday at 2PM in the Lunar hall! So come check out the fantastic new announcements and reveals we will be… revealing! This week brought a litany of things which have happened, the most prominent being that physical copies of our martial arts book have arrived! With the books in we have been working to get them mailed out to our patreon and indiegogo customers. With that, hoofticuffs will be made available digitally to the pre-order store customers on the 28th March and mailed out soon after. 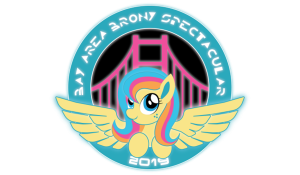 Additionally we have been extremely busy preparing for BABSCon 2019, setting up for the Vendor’s table, and panel! Lastly we have been dutifully churning out art and are still hopeful in getting everything done for the Locked Safe by the end of April. That was everything that’s happened this past week. Until Next week Dead Tree Fans! Be sure to leave a comment, check out our Facebook, Instagram, Twitter and Discord as well as our Patreon, and don’t forget to keep an eye out for our livestreamed game shenanigans! And as usual, be careful, it’s a wasteland out there! We come bearing some great news! 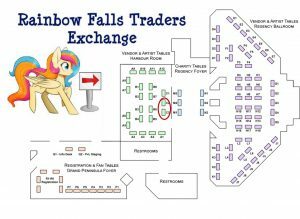 As you all may be aware, we have a table in the Vendor’s hall at BABSCon 2019! Well we have received our table locations! 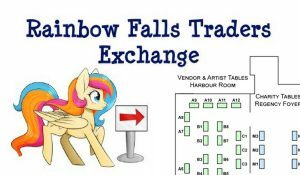 We will be in the Harbour Room, at Tables C2 and C3 right beside the door! In other news we have been chugging as much caffeine as we can and have been churning out art by the tonne. Still no set release date for the Locked safe, but we are making significant progress! Rubber Chickens were… Fast as Lightning…? 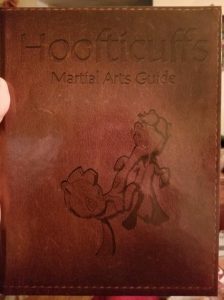 As those of you in our Discord Server already know, our Martial Arts guide: Hoofticuffs, has been released to our Patreon/Indigogo customers as of the 28th of February, and can expect physical books to be mailed out as soon as we get them from the printer. Those who purchased the books online can expect the pdfs on the 28th of March, and physical copies mailed out soon after. With Hoofticuffs finished, we are now doubling down on the remaining art for the System Compendium. With a little luck and persistence we might be able to get the book released to Patreon/Indigogo customers by BABSCon 2019. However a string of health issues plaguing our lead artist is making that difficult, so don’t hold your breath. Every pony was Kong.. Phooey… Fighting…? This week our dev blog is going to be rather short, as all that happened was book formatting (yay). Which is great because the Martial Arts Guide is about 98% done, and should be sent off for editing in a day or two. At which point it will take about a week or two to get edited and then sent off to the printer hopefully before the end of the month! That was everything that’s happened. Until Next week Dead Tree Fans! Be sure to leave a comment, check out our Facebook, Instagram, Twitter and Discord as well as our Patreon, and don’t forget to keep an eye out for our livestreamed game shenanigans! And as usual, be careful, it’s a wasteland out there! The book building was fast as lightning. This update is a short but exciting one, because this weekend we have finally fimished all the stating and writing for our Martial Arts guide and started putting everything into book format. With a little luck, and with our day jobs not demanding 18hr days (so more luck) we are hoping to get the book ready for the editors in 1-2 weeks. And have the book edited and ready to print by the end of February. So fingers crossed. Now in usual DTS luck fashion watch life hate us and make it not happen. Though bad luck or not the Martial Arts guide will be publicly released and available at BABSCON 2019. Though it should be publicly available in late March/Early April. Other things which happened were lots of art for the locked safe, and Ty’s computer died again, significantly slowing down the art process for the locked safe. Meaning no art will happen until his computer is replaced or the Martial Arts Guide is done and L9OBL can start doing art again. That’s everything which happened this week, until next time Dead Tree Fans! As usual please check out our Twitter, Discord, Facebook and Patreon, as well as our store. Remember to be careful because it’s a wasteland out there! We come to you with a couple exciting Bits of news! The first is that we will be Vending at BABSCon 2019!! As usual we will also be running games all throughout the 4 day convention. In addition to our BABSCon appearance we are planning on having our next book released in time to sell! 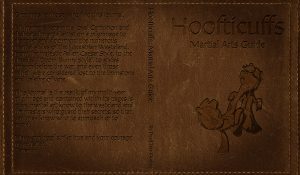 This next book will be: Hoofticuffs: A Martial Arts Guide. Where all of our Martial arts systems will be at the dismay of your enemies. We are also HOPING to get our system compendium, The Locked Safe, out in time for BABSCon. No guarantees, but our fingers are crossed. With that, we also want to announce the price of our Compendium is increasing. As we had mentioned in a Dev Blog last year, we have increased the price from 40$ to 60$ as of this weekend. This is because the book ended up being almost twice as large as we had initially thought, and if we sell the book for 40$ we won’t be able to make any money. The price of the Digital packs/CDs, and the Full Box set will not be affected, however other bundles with the Locked Safe in it will find their prices adjusted accordingly. Those who already pre-ordered physical copies of the Locked Safe, will still get their copy at the price they purchased. Other than those big announcements the normal updates of “lot’s of art got done”‘ is really all that’s left. Tier five weapon art has been finished and put into the Locked Safe, all the art that will be present in the Martial Arts guide is done and the writing is almost complete. One of our rarer “On-Time” Dev blogs today! Brining you the usual news that much art has been accomplished. Over 90% of the weapons for the System Compendium are done. Which makes up a fair chunk of the book’s art. Also more art for the Martial Art’s guide has been finished. Aside from that We also did some minor pre-convention planning and L9OBL ran an excellent one-shot game on Christmas Day which started with most of everyone trying to save the Wasteland equivalent of Hearth Warming Eve from the dreaded Krampus and ended with half the party trying to kill Sandy Claws. You know, the usual. Greetings Dead Tree Fans and Happy Holidays! We hope you are all having a wonderful Christmas Eve and that it will lead to a happy Christmas Day! To Update you all on everything that’s happened since our last Dev Blog. Mostly the usual, art, art and more art. Most of the weapons for the System Compendium and about 80% of the art for the Martial Art’s Guide are done and maybe about 40% of the bestiary art is done. But *Someone* keeps imagining up new monsters of terrible TPK design. So we will see. That was the long and short of everything that’s happened. Until Next week Dead Tree Fans! Be sure to leave a comment, check out our Facebook, Instagram, Twitter and Discord as well as our Patreon. And as usual, be careful, it’s a wasteland out there! As you can guess, we’ve been our usual, super busy selves and kept forgetting what day of the week it was. Big things which have happened are: Art, Art, More Art. Just been lots of drawing and vectoring, trying to get art done for books. The other thing which has happened is that we have updated our freely available “Pre-Alpha” Rule set with the more accurate “Quick start Guide” Rule Set. What does this mean? Well we will soon be taking down the Alpha rules PDF on our website and uploading our “Quick Start” guide rules. Which is just the WSG minus all the art and without any of the lists. How is it a “Quick Start Guide” Dunno. that’s just the name we called, it’s not very quick, but it’s definitely a great start! So keep an eye out for when that goes live. Copyright © 2015-2016 DeadTree Studios - All rights reserved.